For the rest of the week, we're taking a break to give thanks for so many things. This is our last issue until Monday, November 30. Enjoy the holidays, and may all booksellers have excellent Black Friday, Small Business Saturday and Indies First celebrations! 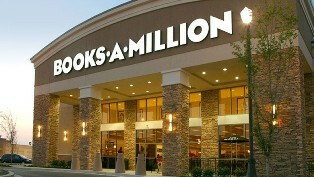 In the third quarter ended October 31, revenue at Books-A-Million rose 0.4%, to $101.6 million, and the net loss was $7.1 million, compared to $6.9 million in the same period a year earlier. Sales at stores open at least a year rose 1.6%. For the year to date, revenue fell 0.6%, to $311.3 million and the net loss was $18.2 million, compared with a net loss of $15.5 million in the same period a year earlier. Sales at stores open at least a year rose 0.1%. In an earnings call after the announcement, CEO and president Terrance G. Finley commented: "Our comparable sales performance for the period improved modestly over the prior quarter and was again driven by--largely by--an ongoing growth in our general merchandise or gift area and by improved performance in our core book department." Comparisons were made difficult because of the success last year of "several media-driven properties like Frozen and teen movies--for John Green's Fault in Our Stars and Veronica Roth's Divergent series." But that was offset somewhat by "the growing coloring book trend and advantageous author event schedule and a stronger publishing lineup." The general merchandise department, cafes and book departments all had "favorable comparisons," while media, magazine and electronics departments continued to "contract." BAM had "nice results" from expanded offering of gifts and book-related accessories. Because of the popularity of adult coloring books, the sale of markers and colored pencils rose significantly. General and license adult strategy games, metal marvel puzzles and LEGO Brickstructures were "our key items in the games and puzzle category, while growth in the toy category continue to be fueled by sales of adult collective merchandise including Funko's Pop! Figures." Finley noted that BAM hosted "several successful author events with Dr. Ben Carson during the period, which droves nice sales increases in our face point category. As has been the case for several quarters we continue to see a solid performance from our kids' book department as well as graphic novel category where sales of Manga series continue to grow appreciably." The "stronger publishing lineup" included The Rogue Lawyer by John Grisham, See Me by Nike Sparks, Killing Reagan by Bill O'Reilly and Thomas Jefferson and the Tripoli Pirates by Brian Kilmeade. Finley said the company has been preparing for the holiday season by "fine tuning our assortments and merchandise presentations" and noted the importance of "several book-related movie and television adaptations that will help drive customer interest in sales activity. And, of course, we're looking forward to an exceptional movie event December 18, with the release of Star Wars: Episode VII." World Book Night 2016 officially kicked off yesterday in the U.K. and Ireland with the Reading Agency announcing the 15 titles to be given away next April 23. The list includes crime, poetry, nonfiction, Quick Reads, YA, historical fiction and fiction in translation (You can check out the WBN 2016 titles here), but a lack of diversity among the writers featured has stirred controversy. After the list was announced, author Nikesh Shukla wrote in the Bookseller that even though WBN is "wonderfully charitable way of spreading your love of reading with friends and strangers alike," he had concerns about the selections: "Much as World Book Night has bravely decided to diversify the types of books offered for its lists by including fiction, nonfiction, genre and translated works, it seems to have left off any Black, Asian and Minority Ethnic (BAME) writers in 2016. Which is, in my eyes, a sadly wasted opportunity to be truly diverse." He also suggested a list of books that might be included in the future. This morning, WBN project manager Rose Goddard responded that it was a "great shame, and with huge regret... that we weren't able to include any works by BAME authors this year." Noting that the "curation of the final books is not simply a question of choosing freely from publishers' lists; publishers submit titles for the list and financially support the printing of the titles selected and the programme overall," Goddard said, "Each year we strive to strike a balance across the list. This year, despite our best efforts, we have not been successful in respect of BAME writers." She added: "We will use this year's experience and feedback to build support to help shape World Book Night lists of the future; they should and can be a home to diverse, wonderful and brilliant books by authors from all walks of life. Let's keep talking and work together to help make this happen." 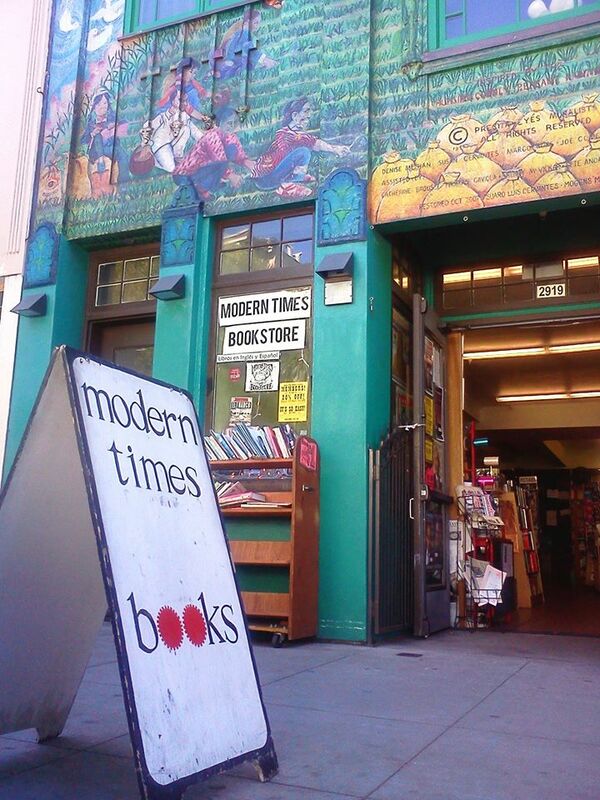 For Sale: Modern Times Bookstore Collective in S.F. Modern Times Bookstore Collective, San Francisco, Calif., which has been in business for more than 40 years, has been put up for sale. Manager and book buyer Ashton De Vito told Capp Street Crap that owner Ruth Mahaney, one of the collective's founding members, is retiring and the hope is to find "someone who can come in and fill that void a bit.... We are flexible about that role and what that means." The bookstore holds its lease through early 2016. An ad posted to Craigslist yesterday said the store "seeks a buyer or investor to assist with the expansion of the store's vision: To preserve, enhance, and serve the literary and cultural heritage and community interests of the Mission District and San Francisco. Esteemed throughout the wider literary community, with a national and international reputation among authors and readers for its commitment to global politics, social justice, and human rights issues, it is hoped the right buyer or investor will not only acquire a fully staffed and stocked bookstore, but preserve a historic, legacy business." Amazon Opening Warehouse in Fall River, Mass. 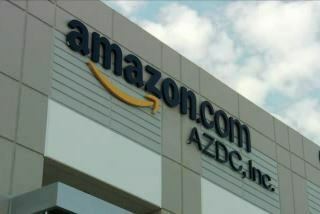 Amazon plans to open a million-square-foot fulfillment center in Fall River, Mass. The online retailer currently operates a sortation center in Stoughton as well as research and technology offices throughout the state. "Our footprint in Massachusetts continues to grow," said Mike Roth, Amazon's v-p of North America operations, calling the state "a great place to do business." Governor Charlie Baker said the fulfillment center "will bring an important economic boost to one of our gateway cities and the surrounding region." To counter the retail frenzy of Black Friday, bookshops in the U.K. and Ireland will celebrate #CivilisedSaturday this weekend. "In Kibworth next Saturday, a bookshop will be offering tea, cake and hand massages in a green velvet armchair," the Guardian reported. "In Crickhowell's local bookstore, there'll be a butler on the door serving Prosecco." Calling Black Friday "the antithesis" of what booksellers stand for, Alan Staton, head of marketing at the Booksellers Association, said, "It's about discounts, it's about a feeding frenzy, so we said why don't we have a #CivilisedSaturday, which shows that what booksellers offer is an informed, civilized environment for people to make purchases. It may be for people who have gone through Black Friday and need some R&R afterwards, or for those who shun it for a more civilized alternative." "How do Canadian reading habits measure up against American ones?" CBC Books featured an infographic created by Booknet Canada, which "conducted an online survey to find out how many Canadians had read books and in what form over the last year. In what they call, a 'spirit of healthy competition,' they also compared their results to an American study by the Pew Research Center." Among the findings: When asked if they had read a book last year, 84% of Canadian respondents said yes, compared to 72% of Americans. 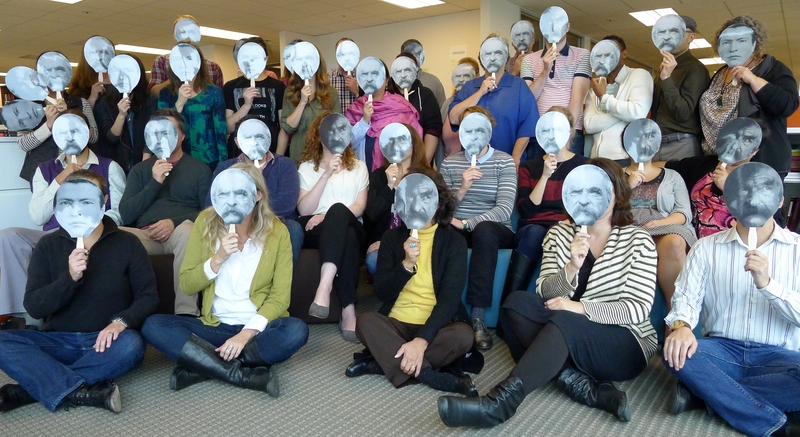 Next Monday, November 30, is Mark Twain's birthday, so to commemorate the occasion, his 180th, and to celebrate the third and final volume of his autobiography (Volumes 1 and 2 have sold more than 500,000 copies), the University of California Press team posed with masks of the three faces of Twain, as depicted on the cover of each volume. 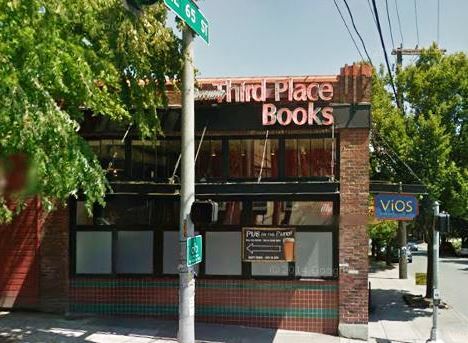 Matador showcased "11 underground spots in Seattle to check out before they go mainstream," including Third Place Books & Pub: "At street level, Ravenna's Third Place looks like any other cozy independent bookstore. But down in the basement you'll find a great bar with 18 rotating taps. Playing host to live music, book club gatherings, and Magic Mondays (where, every so often, the PNW's finest magicians get together to perform in the spirit of the London theater cabarets), the Pub at Third Place serves up choice dishes including mezze plates, eggplant sandwiches with grilled halloumi, and kopanisti dips made from roasted red peppers and feta. And it's all good. All of it. There's also a sister cafe upstairs that serves housemade Greek food." 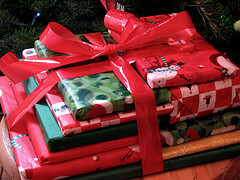 The Booksmith in San Francisco, Calif., is once again setting up a volunteer-staffed gift wrap station: "Each shift is 3 hours and you will wrap books for tips. Tips will be collected on behalf of To the Streets, a 501c(3) which provides homeless youth in the Haight Ashbury with housing in exchange for street sweeping services. Since it started last year, To the Streets has housed over 30 youth and helped many to transition to more permanent work and living situations." Warren the 13th and the All-Seeing Eye by Tania del Rio, illustrated by Will Staehle (Quirk Books). The Today Show: Nathan Lane, co-author of Naughty Mabel (Simon & Schuster, $17.99, 9781481430227). All Things Considered: Matthew Rowley, author of Lost Recipes of Prohibition: Notes from a Bootlegger's Manual (Countryman Press, $27.95, 9781581572650), and John Hessler, contributor to Map: Exploring the World (Phaidon, $59.95, 9780714869445). Tavis Smiley: Mitch Albom, author of The Magic Strings of Frankie Presto: A Novel (Harper, $25.99, 9780062294418). Last Call with Carson Daly repeat: Jewel, author of Never Broken: Songs Are Only Half the Story (Blue Rider, $27.50, 9780399174339). Late Show with Stephen Colbert repeat: Elizabeth Gilbert, author of Big Magic: Creative Living Beyond Fear (Riverhead, $24.95, 9781594634710). Face the Nation: Karl Rove, author of The Triumph of William McKinley: Why the Election of 1896 Still Matters (Simon & Schuster, $32.50, 9781476752952). The Vaults, a London arts and theater venue, is collaborating with Scholastic on a new show based on R.L. Stine's Goosebumps series. The Bookseller reported that the "interactive show will lead audiences through the Vaults' abandoned railway tunnels in Waterloo to experience scenes based on some of Stine's most iconic books," including Stay Out of the Basement, One Day in Horrorland, Night of the Living Dummy and Say Cheese, and Die!. Targeting an adult audience, the Goosebumps The Show will run April 6 to September 4 next year. Tom Salamon is the project's writer and directer, with Samuel Wyer as the designer, and the band Tiger Lillies writing the score. A children's version of the production, Goosebumps Kids, will open in May and take place every weekend until September. 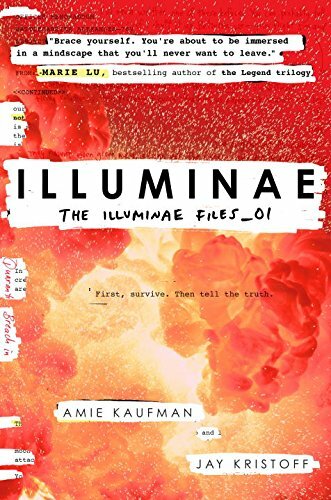 Brad Pitt's Plan B Entertainment and Warner Bros. are teaming up to adapt Illuminae, the new YA sci-fi novel by Amie Kaufman and Jay Kristoff. The Hollywood Reporter wrote that Pitt will produce along with Plan B partners Dede Gardner and Jeremy Kleiner. A search for writers to adapt the novel has begun. The latest trailer for The Big Short, based on the book by Michael Lewis, "sees Ryan Gosling, Steve Carell, Brad Pitt and Christian Bale waging war against the American banking system," the Hollywood Reporter noted. Directed by Adam McKay, the movie hits theaters December 23. Kenneth Branagh will direct and star in 20th Century Fox's remake of Murder on the Orient Express, based on Agatha Christie classic mystery novel. Deadline.com reported that Branagh will also produce along with Ridley Scott, Simon Kinberg and Mark Gordon. Michael Green (Blade Runner 2) is writing the script. 7 p.m. Tom Gjelten, author of A Nation of Nations: A Great American Immigration Story (Simon & Schuster, $28, 9781476743851). Finalists for the 20th annual Books for a Better Life Awards, sponsored by the New York City-Southern New York Chapter of the National MS Society, have been announced. Winners will be announced during the awards ceremony in New York City on April 18, 2016. See the 50 finalists here. Precious Gifts: A Novel by Danielle Steel (Delacorte, $28, 9780345531032) follows the lives of the wife and four children of a charismatic man who abandoned them. House of the Rising Sun: A Novel by James Lee Burke (Simon & Schuster, $27.99, 9781501107108) is the latest Holland Family novel. The Selected Poems of Donald Hall by Donald Hall (Houghton Mifflin Harcourt, $22, 9780544555600) collects poems from the former poet laureate of the United States. Tom Clancy Commander in Chief: A Jack Ryan Novel by Mark Greaney (Putnam, $29.95, 9780399176760) posthumously continues Clancy's Jack Ryan series. An Evil Mind by Chris Carter (Emily Bestler/Atria, $25, 9781476765686) continues the Robert Hunter thriller series. Power Words: What You Say Can Change Your Life by Joyce Meyer (FaithWords, $10, 9781455587889) offers faith-based advice. Blood Kiss: Black Dagger Legacy by J.R. Ward (Signet, $7.99, 9780451475329). Macbeth, starring Michael Fassbender and Marion Cotillard, opens December 4. Shann Ray grew up in Montana, played college basketball at Montana State University and Pepperdine University and professional basketball in Germany. His work has appeared in Poetry, McSweeney's, Narrative and Montana Quarterly, and has been selected for the Best New Poets and The Better of McSweeney's anthologies. He is the author of Balefire, a poetry collection, and American Masculine, a collection of stories. 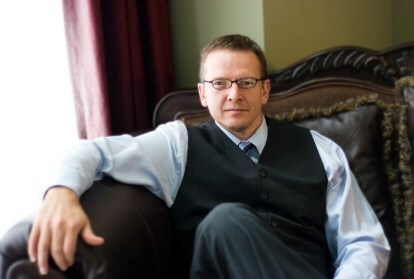 He lives with his wife and three daughters in Spokane, Wash., where he teaches leadership and forgiveness studies at Gonzaga University. 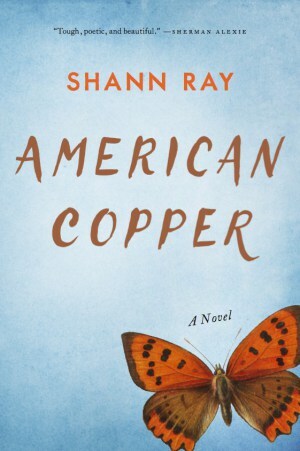 American Copper (Unbridled Books, November 3, 2015) is his debut novel. Since my nightstand is so small, let's consider my desk my nightstand for a minute. Here, so many lovely, deeply felt, gorgeous books reside in not so neat stacks! C.D. Wright's Deepstep Come Shining; Claudia Rankine's Citizen; Jericho Brown's The New Testament; Michael Ondaatje's Coming Through Slaughter, The Collected Works of Billy the Kid and The English Patient; Sherman Alexie's War Dances; Carolyn Forché's anthologies Against Forgetting and Poetry of Witness. These and many more have been like good brothers and sisters while I was writing American Copper. In the novel, a copper baron's daughter named Evelynne Lowry, a Cheyenne cowboy and team roper named William Black Kettle, and a steer wrestler/bar room brawler named Zion address the darkness that often overwhelms them--the heartlessness of colonialism, the rage of racial injustice, the isolation of wealth and privilege--and in the end, they give something ultimate in order to reach toward forgiveness and atonement. In Montana, I spent part of my childhood on the Cheyenne reservation. My family lived in trailers and mobile homes where the talk and the action was mostly about basketball and almost everything occurred in threes--as in 3-point jump shots. There were also dunks, quick moves, ball-handling skills, swishes and all around string music. Books were respected but not adored until later. My favorite book as a boy was Curious George, but mostly my family loved the wilderness and spent a lot of time in the mountains of Montana. When I started dating a girl named Jennifer, I was 17, and books became heart and soul. She introduced me to The Secret Garden, Candide, A Tale of Two Cities, Great Expectations, The Four Loves, Anna Karenina, War and Peace, Crime and Punishment, Les Misérables. Five years later, I married Jenn and the reading never stopped! Lots of books assigned in high school and college. Sadly. The Catcher in the Rye comes to mind with a sting. Recently, I've loved the intricate, nation-bending work of these three: Toni Morrison's Home, Marilynne Robinson's Gilead and Graham Greene's The Power and the Glory. I was too scared to send love letters to Toni Morrison and Marilynne Robinson, or hold a séance to thank Graham Greene. Then I fell even more for C.D. Wright's Deepstep Come Shining, and I did muster the courage to write her. To my great surprise, she wrote back. She's as graceful and generous as her poems suggest. All the Light We Cannot See by Anthony Doerr. Stunning. Absorbing. The cover takes you down into the book as if you've surrendered yourself to the ocean, the city, the light. And the book is an irreplaceable gem, among the very best novels I've read in the last 10 years. The Stranger by Albert Camus. "Create dangerously!" Gadamer's Truth and Method, who can fathom the depths of it? And I and Thou by Martin Buber, for the way it transcends dogma. All of the above, but I want to specifically say Fools Crow by James Welch for its evocation of the Blackfeet culture at the height of its power, which was every bit as dignified in grandeur and collective fierceness as the Roman empire. Also N. Scott Momaday's House Made of Dawn, for the poetic beauty and confrontation of American colonialism found in the title and in the prose. Finally, Milan Kundera's The Unbearable Lightness of Being, because we share Czech heritage, and for how he found an elegant and perhaps inescapable way to reach into Czech and Eastern Bloc Communist hyperbole and come out with greater notions of individual and collective responsibility for past atrocities. "It was a pleasure to burn." --the opening line of Ray Bradbury's Fahrenheit 451. Emily Dickinson's collected poems: "Take all away from me but leave me ecstasy.... Not knowing when the dawn will come I open every door.... I am afraid to own a body/ I am afraid to own a soul." Gerard Manley Hopkin's collected poems: "It will flame out like shining from shook foil/ it gathers to a greatness like the ooze of oil." Shakespeare's collected poems: "Let me not to the marriage of true minds/ admit impediments. Love is not love/ which alters when it alteration finds." The Book of Isaiah, to me the most heartrending of sacred scriptures: "beauty for ashes... and the garment of praise instead of the spirit of despair." Tolstoy's War and Peace: "Nothing is so necessary for a young man as the company of intelligent women." The Letters of Vincent Van Gogh. In those letters, Vincent says, "The greatest work of art is to love someone." The letters show a heart so full of love and so rich with desire for art, beauty and life. 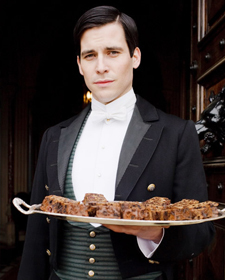 He was always poor as far as money in the pocket, but in the heart he was among the richest of all people. Poetry is my first love for the silence between the words, and the call to something higher. Great novels that read like poetry to me include: Housekeeping by Marilynne Robinson, The Bluest Eye by Toni Morrison, Ceremony by Leslie Marmon Silko, All the Light We Cannot See by Tony Doerr, Fools Crow by James Welch, To the Wedding by John Berger and Wise Blood by Flannery O'Connor. Tibble, a shy newspaperman, prefers cats to people. He is an excellent writer for the Killenthorn Courier, but his editor calls him into his office one day. "Your articles are always about cats," he says. It's true. Tibble is a "real cat lover" and knows all the local cats. He points out to the editor that there's already plenty of news in the newspaper. "I thought people would like to read about cats and leaves for a change," says Tibble. His editor firmly disagrees and gives him one last chance to write an article containing real news, and he wants it by morning. The discouraged reporter heads out into the city looking for something interesting to cover until he's so tired he sits down on a bench in Green Square. Suddenly, a big German shepherd, barking furiously, goes racing after--what? A cat? A stork? The dog chases it into a tall elm tree. Tibble and his accidental benchmate, Mr. Smith, look up into the tree and see "A leg. A leg in a stylish stocking with a shiny, high-heeled shoe on the foot." " 'Heavens,' " said Mr. Smith. 'It's a lady.' " Tibble helps the frightened young woman down from the tree--she is "tremendously agile"--and wonders whether this outlandish scenario is perhaps newsworthy, but he feels too shy to ask her any questions. 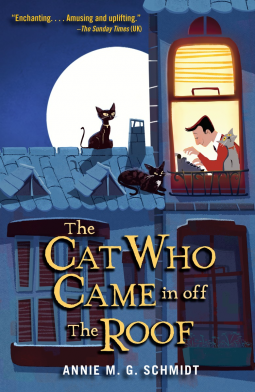 Shelf Talker: In this charming Dutch classic, the life of a newspaperman named Tibble is changed forever when he encounters a strange young lady who used to be a cat.